Examples abound of the ways in which nature abhors a vacuum. Raptors will set up shop on a skyscraper ledge, just as they will on a cliff, if it suits their needs. Coyotes have been increasingly spotted in urban settings, even roaming about the streets of Manhattan. Last year, surveillance cameras captured images of a mountain lion strolling the Hollywood Hills after dark. Nuclear power plants are also home to a variety of wildlife. Despite the industrial nature of these facilities, they are usually situated on large tracts of land encompassing hundreds of acres. They are also adjacent to bodies of water in order to tap into that H20 for cooling purposes. All of that property and access to water can entice a variety of animals and birds to take up residence on the sites. And they do just that. Information supporting this can be found in the Post-Shutdown Decommissioning Activities Reports (PSDARs) for U.S. nuclear power plants that have ceased operations. 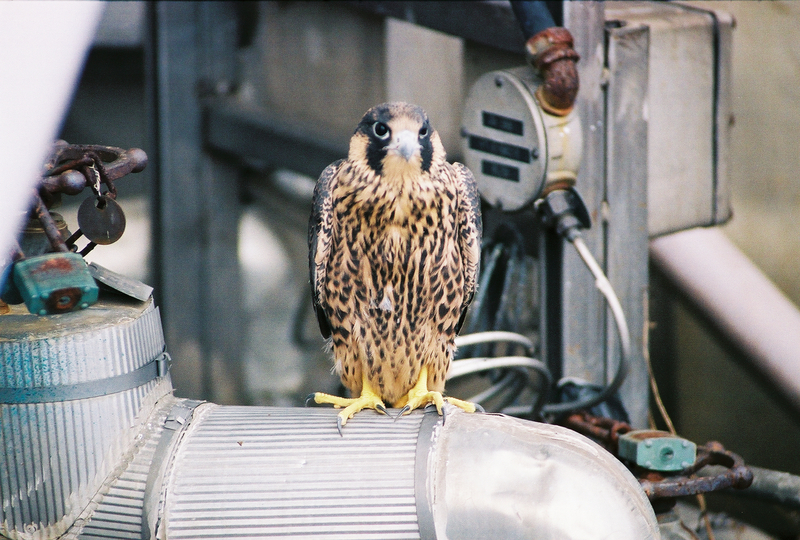 In the report for the Vermont Yankee nuclear power plant, which was submitted to the NRC in December 2014, it’s noted that the main emissions stack includes an attached nesting box for peregrine falcons. The box was installed by the company in 2009 at the request of the Audubon Society. Current decommissioning plans call for the Vernon, Vt., plant to be placed in storage for several decades prior to the initiation of major dismantlement work. However, when the time comes to remove the stack, the plant’s owner will need to consult with the U.S. Fish and Wildlife Service prior to removing the nesting box since the peregrine falcon is protected under the Migratory Bird Treaty Act. Peregrine falcons can also be found at the Three Mile Island nuclear power plant, in central Pennsylvania. The PSDAR for TMI-2, where a severe accident occurred in 1979 and which won’t be taken apart until the neighboring TMI-1 permanently shuts down and is also ready for that work, shows peregrine falcons have nested on the TMI reactor building since 2002. An osprey can be seen in flight at a nuclear power plant site. 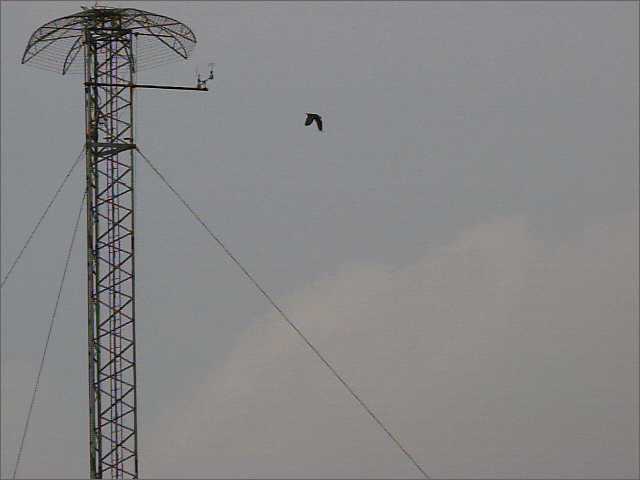 Meanwhile, the plant’s meteorological tower, which collects important weather data, has been home to an osprey nest every year since 2004. Ospreys, also referred to as fish hawks (with a wing span from around 5 feet), like to be around water, so it’s not surprising that TMI, situated on the Susquehanna River, is a place they call home. A variety of wildlife can be found in the vicinity of the Crystal River 3 nuclear power plant, located on the Gulf Coast of Florida. That plant’s PSDAR, which the NRC received in December 2013, identifies the following threatened or endangered species in the vicinity of the site: Two species of fish — Gulf sturgeon and smalltooth sawfish; five species of sea turtles — green turtle, hawksbill, Kemp’s ridley, leatherback and loggerhead; one crocodilian species — American alligator; and one marine mammal — Florida manatee. But on the site itself, only one state-listed threatened species, the bald eagle, and one state-listed endangered species, the wood stork, are found, according to the report. The PSDAR adds that three other species can “potentially occur” on the property: the gopher tortoise, the eastern indigo snake and the piping plover. In the case of all of these plants and the others around the country, precautions must be taken to minimize the impacts of operations and decommissioning activities on these species and their habitats, consistent with federal and state laws.